Every new mother spends almost all of her time with the child. But sometimes she needs to do some household chores or work. But what if the child does not want to stay alone and has difficulty being alone in general? Let’s discuss how to solve this problem. 1 Why is the child afraid of staying alone? 2 For how long can you leave a child alone? 3 How to teach a child to play alone? 5 Gradually increase the time. 6 Tell the child where you’re going. Why is the child afraid of staying alone? Children who are 3 years old or younger cannot navigate well in space around them and cannot think abstractly. If a child never stayed alone in the room they will get frightened when they suddenly realize that they were left without outside support. So it is completely normal if your child has a hard time staying on their own. Teaching the child to be alone for a while needs to be done correctly. For how long can you leave a child alone? 3-year-olds and younger children cannot concentrate on one thing for long. 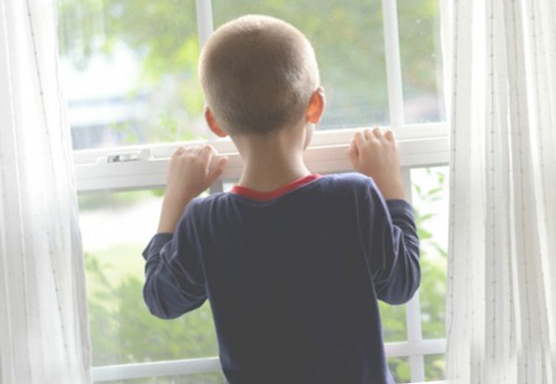 If you do not want the child to notice unwanted or dangerous objects out of boredom then do not leave them unattended in a room for longer than 10-20 minutes. How to teach a child to play alone? In order for the kid to not even notice your absence in the room, they must be able to concentrate on something. Your task is to teach the child to enjoy learning and playing games. Observe the behavior of the child and note which types of games and activities they like most. You cannot just hand the child pencils and immediately escape to another room for 20 minutes. Start drawing or playing with the child, gradually transferring the initiative into their hands. When the kid is carried away completely, gently tell them that you will return in 5 minutes, and leave the room. If the child does not have phobias then they should agree. Try to look after the child without going into the room: if they draw/play with enthusiasm then everything is alright. After the promised 5 minutes you must return to the room because you cannot deceive the child. After a couple of days, repeat this exercise but leave the room for 8-10 minutes. If the baby child will call you do not run at once but just calmly say that you will come soon. The kid will calm down from the sound of your voice and wait for another couple of minutes. Tell the child where you’re going. The kid will be calmer if they understand why and where you left. Also, mention the exact time when you return. The kid, most likely, still does not know how to read the clock so measure the time in units that they can understand: when you finish building the pyramid, I’ll be back. Never say “I’ll be back in a minute” and leave for an hour. Otherwise, the kid will always be afraid of you leaving because they do not know when you’ll be back. If you need to leave for a long time, ask someone to stay with the child and be honest: I’ll come when it’s dark outside. Fear of loneliness is a normal childhood fear and it is necessary to get rid of it very slowly and carefully.